Spin This: "Into You," "Be Alright"
My Everything, Ariana Grande’s sophomore album, proved to be a glorious testament of pop vocal mastery and smart song selection, and stands out as being far superior than her debut LP on every level. Each motion seemed to chronicle lessons taken from the old school Clive Davis workbook on how to establish a pop star diva. 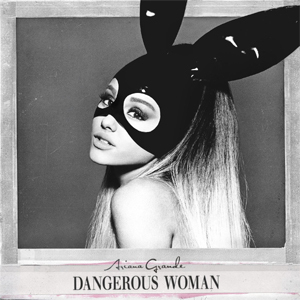 So it’s not that much of a surprise to know that Dangerous Woman, an album that sports Grande wearing latex bunny ears as if she’s prepping for the role of Catwoman, is an artistic let down. It’s not like this album doesn’t try. Grande attempts to find new musical outlets to explore, possibly weary of being pigeonholed into teen bop compilations, synthpop ditties and the Christina Aguilera/Mariah Carey contemporary R&B formula. The finger-snapping, harp-tinseling love ballad “Moonlight” drops her on bed petals of into Minnie Riperton romance. She pulls off her naughtiest striptease on “Thinking About You” (“Have my eyes rolling back and the arch in my back”). “Leave Me Alone” finds a haunting intro featuring Macy Gray channeling Nina Simone emotion. She jumps out of her style comfort zone a little with the reggae-tinged, rock-embellished title track. Reggae is enforced even more on “Side to Side,” where Grande is forced to play with throwback Rihanna grooves. She even brings in “Bang Bang” star Nicki Minaj for more funk and street cred. And there’s also the lack of danger and dark side imagery that Grande fails to drop on us with this quasi-Sasha Fierce alter-ego. Dangerous Woman just feels like a safe, but very lackluster of a follow-up to the hit-loaded My Everything, which is pretty unfortunate.